This is the only planet that allows you to grow a population. Population is the main source for taxes and therefore planets with a huge population are crucial for the construction of ships. Upgrading a metropolis increases its defense slightly. 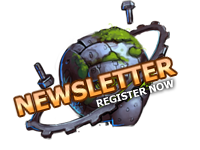 Upgrading the metropolis also increases the maximum capacity of your population. A metropolis can be upgraded three times. as defenders are needed to protect the planet from being conquered. 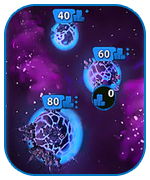 A space fortress attacks all enemy ships within its immediate radius. 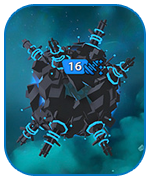 Once the player owns a space fortress, its power radius glows with the player’s color. The space fortress can be upgraded three times. 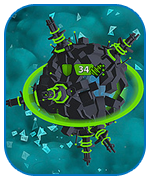 Upgrades increase the attack speed and the defense of their weapons. 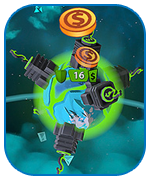 A bank planet does not attract people either, but it produces money every few seconds, even during attacks; a stark contrast to the metropolis. And this is its great advantage: It can effectively double your wealth! 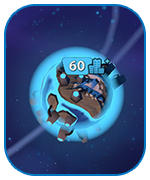 A bank planet has the lowest defensive strength and it cannot be upgraded. Unlike the human metropolis, this planet produces energy, not taxes. It can be upgraded up to three times, which slightly increases its defense and the number of potential robots living there is also increased. During the upgrade the planet is vulnerable, as robots use their own body parts to achieve the upgrade. This planet differs in its outer appearance from the humans. It can be upgraded three times, increasing its attack force and fire speed. During the upgrade the planet is vulnerable, as robots use the planet’s population for an upgrade. This is the robot equivalent of the human bank planet. Even in wartimes it produces energy for the energy pool, and it can raise the overall energy pool to level 2. A powerplant cannot be upgraded, and has a weak defense. 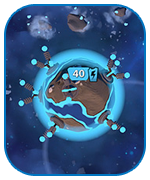 From a certain point in the game, all planets can be upgraded into another planet type which enhances the upgrade possibilities of all planets from 3 to 5.